Zybez RuneScape Community was shut down on September 17th, 2018. You're viewing an archive of this page from 2018-12-02 at 04:54. Thank you all for your support! Please get in touch via the Curse help desk if you need any support using this archive. AKFG and The Pillows, FTW. Ever since the Achievement board came out there have been all kinds of amazing goals and achievements posted. 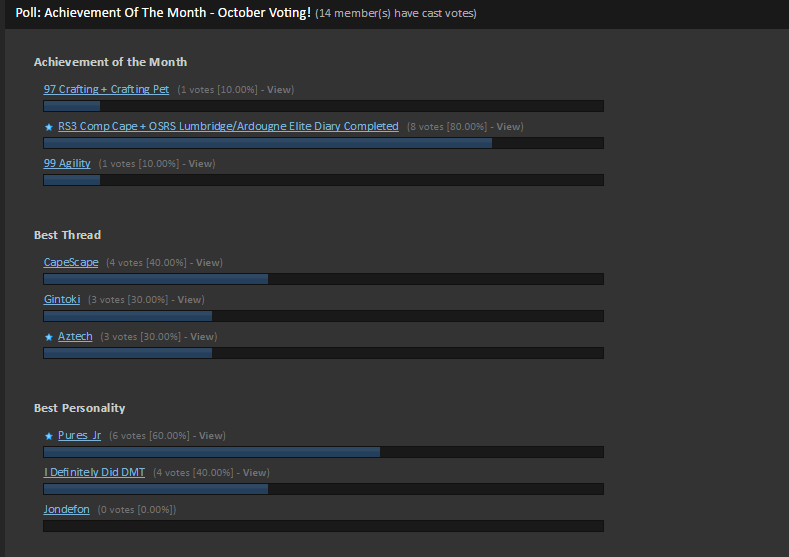 So we decided to hold a monthly contest where the users of RSC could vote on who they think had the best achievement for that month. Voting is held for 5 days during the following month (so for example, November's voting will be held for 5 days at the beginning of December). Only achievements that were completed in that month are able to be nominated for the voting. 1) Only Legit Achievements - Only achievements that are 100% legitimate are able to be in the AotM. False achievements will result in you being suspended from future AotM nominations. All achievements must be completed by you, on your own character. You can not nominate somebody who doesn't want to be in the AotM / does not have an achievement thread here on RSC. 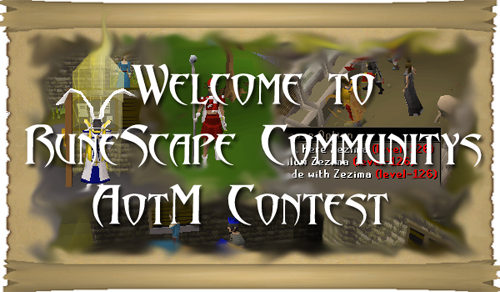 2) RSC Only - Only achievements that are posted on the RuneScape Community forums are allowed to be nominated. 3) That Month Only - To be nominated, your achievement must have happened within the month that you are being nominated for. If you have a mass-achievement thread, in which you have many achievements posted over a large time period, only the month's achievements will be considered for the contest. 4) Bribing / Begging - All votes for AotM must be 100% legit, you are not allowed to bribe people to vote for you, in any way. This means paying them on RuneScape, in real life, or anywhere else. Votes must be placed honestly, and fairly. 5) Advertising - No advertising in any shape or form whatsoever is allowed. You cannot advertise for people to nominate nor vote for you, on RSC or off of it on any exterior website. If you are found to be advertising to try and lure people to vote for you, you will be subsequently removed from that competition and could face a long-term ban from being nominated in future competitions. To allow fair voting to ensue, advertising cannot be allowed. 6) Self Nominations - Only other community members can nominate you for an AotM, you are no longer allowed to nominate yourself. If your achievement is good enough, people will nominate you anyways. 7) Time Limit - You are only allowed to win an AotM award once in each respectable category every THREE months. This is to keep the AotM open to everybody, not just the same people month after month. So please don't try to nominate somebody who won less than THREE months ago. 8) Reason For Nominations - When nominating someone, you HAVE to give a reason for your nomination, not just nominating someone because he owns, or is your best friend - so nominations with no reason will not count! 10) Self Voting - It's great being nominated, however we urge you vote as truthfully as you can, that means checking out the other topics you might be up against, from now on when voting we will not accept self votes so don't waste your opportunity; in the case you believe you deserve the win you can always skip voting at all within your category. If you are an AotM winner, click the month above that you won for a banner that can be placed on your achievement thread. Just copy the code below and paste it into the very top of your achivement thread, then fill in your banner's URL (replace "YOUR_BANNERS_URL_HERE" with the URL you get from clicking your month above). Also, all winners now get two months Zybez Exclusive Membership! I am an administrator at the English Wikipedia. See my user page. 1) Banners - Banners will be made as quickly as possible by our currently banner maker. Please give him time to take note of the winner and make the banner. Patience is a virtue. 2) Flaming - Flaming will no longer be tolerated in any way whatsoever. If you flame, you will receive one warning and one warning only. If it is deemed serious enough, the rules will be enforced with an immediate suspension. Flaming, spamming, or anything like that at all is not allowed in this sticky, and since in the past you have received hundreds of warnings, I think this rule is a just measure, at least, for now. 3) Problems - If you have any problems with AoTM, queries, questions, ideas, anything - PM one of the AotM Leaders. Achievement of the Month: <-- Best overall achievement. This is any achievement, single or multiple, you think deserves the title. It is the basic, normal award we've been giving out for years. Old Schooler of the Month: <-- Best overall achievement in OSRS. This is like the above any achievement, single or multiple, you think deserves the title. Best Thread: <-- The beauty pageant for the achievements forum. I would like you to nominate who you think has the most organized, most informative and most eye-satisfying topic. This is not in any means a topic which is popular, or has 2000 posts. It could be any topic, from new to old, which is well-thought out, planned and prepared. Nominate which topic you think looks and feels the best this month. Best Personality: <--- Basically, who represents all things great about this forum. Who is here, every day, making posts, helping in the forum, and generally well known and liked by the majority. Who do you believe is given recognition, but is modest, and answers every person who posts and is always ready to give advice and a helping hand? In essence, this is a popularity contest, who is the most popular, with the best personality in this forum? Remember the main reward still exists as the top category, and the rules still apply. You still would not be able to win any other category more than once every six months, so do not think every month, the same person will win - I assure you, they won't. You can however be nominated for more than one category - so bear in mind, everyone, that you can nominate the same person for more than one of the four, but please do not nominate due to their popularity, we have one category for that now, nominate based on your own valid opinion. Lets say you win in December, you can win the next year in June. I'm sorry if you were told differently in the past, but it has been a point that was never fully clarified until this point. Thanks! Remember to provide a reason why you are nominating someone for their achievement. Saying "because they rock" is not a sufficient reason and your vote will not be counted if you do so. If you can provide a link that is greatly appreciated as well! All old banners that had lost their hosting have been remade by D5. Please give him a big thanks should you see him! You now get Zybez Exclusive Membership for two months if you win a competition! Effective 1-Jan-2017, the Achievement of the Month competition will be replaced by Achievement of the Season. Keep your eyes open for more details coming soon. We would like to thank everyone for keeping this board alive over the past 11 years through the sharing of accomplishments, motivation, and inspiration! If you have any questions or concerns about this competition and its future direction, please contact a member of the AOTM team. With the closing of Zybez, we've decided to give this one final update to include all of the Achievement of the Season and Achievement of the Year winners. If you won a category in any of the Achievement of the Season competitions, just go to the respective award and click on the spoiler and it should be at the bottom. Though there's not much time left, if you notice any issues or maybe I mislinked an image, don't hesitate to message me. Also as a little closing note, we (the Achievements staff) just wanted to say thank you to everyone who has participated in this subforum. Whether you've been around for years or maybe you just posted once or twice, you all made the Achievements section what it was and what it is. Hope everyone has a wonderful life and continues to achieve their goals, both on Runescape and in real life. Best of luck to all! I wish it is always You. Only You and I.